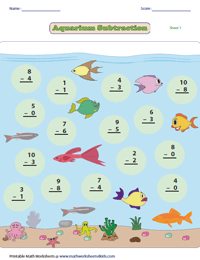 Our comprehensive worksheets are designed to help children develop their foundation in subtraction. 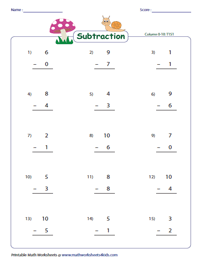 These 0-10 subtraction worksheets include columnar and horizontal subtraction along with word problems, theme-based subtraction, missing numbers, picture-based multiple responses, connect the answers, and equivalent subtraction sentences. A number of free printable worksheets are available for practice. Use the various download options to gain access to all our handouts under this topic. Each worksheet contains 15 problems based on 0 to 10 vertical subtraction. Some worksheets include elementary word problems as well. Find the difference and use the answer key to check your solutions. Use this collection of horizontal (row) subtraction worksheets that also includes word problems to help your children sharpen their 0-10 subtraction skills. This series of eye-catching worksheets are sure to keep your little ones hooked! 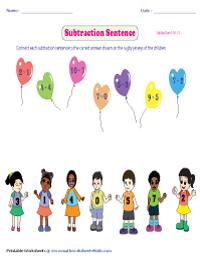 Have fun solving the 0-10 subtraction problems and don't let anyone else burst your bubble! 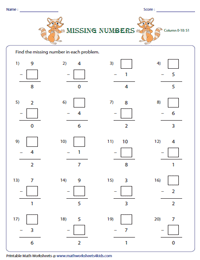 Identify the missing numbers to complete the subtraction problems in this set of interactive worksheets, which include both column and horizontal formats. 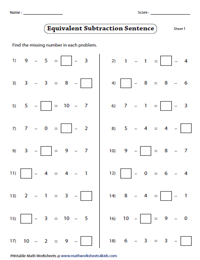 This set of worksheets are sure to hone 0 to 10 subtraction skills as children will have to use logical reasoning to solve them. Fill in the missing numbers to balance both sides of the subtraction equation. 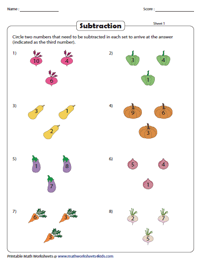 These colorful worksheets will improve a child's understanding of expressing a number in equivalent subtraction sentences. 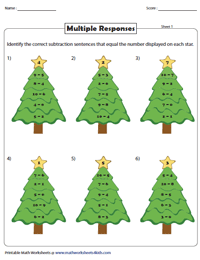 Identify the correct subtraction sentences on the X-Mas tree to the number shone on the star. This set of visually engaging worksheets promises to keep kids as busy as a bee! Connect the balloons with subtraction sentences to the matching values displayed on the rugby shirts. It's the season to be jolly! Circle any two numbers whose difference is equal to the third number. 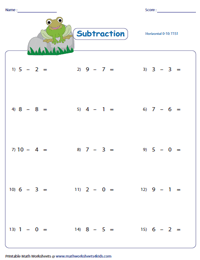 These 0-10 subtraction worksheets help children to frame the subtraction sentences. 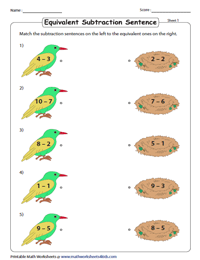 These picture-based worksheets will require children to match the subtraction sentences on the left to the equivalent ones on the right. Use the download option to access worksheets in this section.